There’s a town in Mississippi named Vardaman that calls itself the “Sweet Potato Capital of the World.” How has this gone uncontested, my fellow North Carolinians? If this magazine has taught us nothing else, it’s drilled into our heads that this state, our state, is the country’s leading supplier of sweet potatoes. We create a lot with our rough-hewn tubers: hot sauce, vodka, beer. Without us, Thanksgiving would be less sweet — no sweet potato pie or sweet potato casserole. And if not for our public university system, there’d be no book about sweet potatoes. The University of North Carolina Press, you see, has created a collection of cookbooks, each eponymously named for a Southern staple like biscuits, bourbon, or buttermilk. 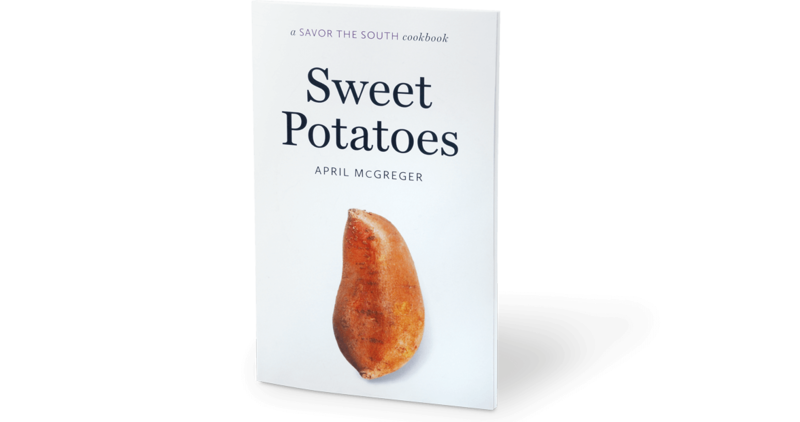 Sweet Potatoes — the 10th, and most recent, entry in the series — came about when UNC Press Senior Executive Editor Elaine Maisner asked chef and entrepreneur April McGreger what singular Southern food she’d like to write about. “Sweet potatoes,” McGreger said. After all, she is the daughter and sister of sweet potato farmers in Vardaman. Yes, Vardaman, Mississippi, the so-called “Sweet Potato Capital of the World,” and home of the Vardaman Sweet Potato Festival, where they crown a Vardaman Sweet Potato King and Queen. They sound like braggarts down there, don’t they? McGreger moved to North Carolina — the real sweet potato capital — to study geology at UNC-Chapel Hill. Eventually, though, less interested in studying the ground than in working with the food that comes from it, McGreger started part-time at the acclaimed Lantern Restaurant in town. She worked her way up to pastry chef, a job she held for four years. Then, McGreger got the idea to launch her current venture, Farmer’s Daughter, which produces locally sourced, small-batch pickles and preserves. She markets her wares through a local community-supported agriculture service that makes deliveries in Carrboro, Durham, and Chapel Hill. How she found time to finish Sweet Potatoes, I don’t know. But I’m glad she did, because the cookbook is so rich with wonderful recipes and food history that it’s almost enough to forgive McGreger for hailing from a misguided place like Vardaman. Almost.